The violence that has engulfed Syria since March 2011 provides the latest and arguably most brutal evidence of the extremes to which a totalitarian regime will go to maintain its grip on power. The depravity of the Assad government, on display for the whole world to see, is nothing new to the people of Syria. And it seems likely that the worst is yet to come. Syria is poised for the kind of tribal and sectarian bloodbath that followed the fall of Saddam Hussein in Iraq, but on a much broader scale. And while this will be horrific for all segments of the Syrian population, it will likely be the final blow for Syria’s embattled Christians. The Assad family represents the Alawites, a minority offshoot of Shiite Islam that constitutes 12 percent of the population of Syria. Throughout more than forty years of draconian rule, the Assads, père et fils, have manipulated Syria’s other minorities—Kurdish, Druze, Ismai’li, Jewish, and Christian—by stoking their fears of a takeover by Sunni fundamentalists and then vowing to prevent it. In exchange, these groups have given the regime their nominal support, which the Assads have then trumpeted as evidence of a policy of benevolent protection. In the political struggles of the Middle East, Christians—all too aware of their minority status—historically have survived by supporting whatever group has come to power. This has put them in the position of being reliant on the protection of ruthless dictators, a fact not lost on the Islamist extremists who have infiltrated the Syrian insurgency. UN observers have documented attacks against Christians singled out for retribution as a result of their pro-Assad affiliation. Along with other minorities who enjoyed the government’s protection, they have been expelled from their ancestral lands, and in some cases kidnapped, raped, and murdered. The Christians of Syria represent a diverse variety of ancient traditions. Western Christians are apt to be most familiar with the Byzantine, or Eastern family of churches, represented by Greek Catholics, or Melkites, as well as Greek Orthodox. Along with the Armenian Church, Syriac Christianity belongs to the lesser known family of Oriental churches. Armenians found safe haven in Lebanon and Syria following massacres in Turkey early in the twentieth century. Understandably, they dread Turkish intervention, but their anxieties are shared by other Christians as well. While the Assad government allowed Armenian and Syriac, the indigenous languages of its Christian minorities, to be taught and used in worship, Turkey’s commitment to its ethnic minorities is open to question. It continues to place restrictions on when and where religious services are conducted, and its much-vaunted program in support of minority languages has yet to be fully tested. The roots of Syriac Christianity go back to Christianity’s very first converts, drawn from the Aramaic-speaking Judaism which flourished in Mesopotamia beginning in the period known as the Babylonian Captivity (587–38 BC). The spread of Christianity followed ancient trade routes that linked Babylonian Jews to their ancestral homeland in Palestine. How Babylonian Jews eventually came to embrace Christianity is not entirely clear, but the eminent Scripture scholar Michael Weitzman has developed the most historically plausible scenario. Following the destruction of the Temple in 70 AD, Weitzman writes, Jews “turned to seek salvation for the individual and their group, which Gentiles might enter as proselytes. Later, this group might have embraced the church, which shared its dearest values—prayer and faith—while providing a rationale for the neglect of ritual.” Such a process would explain not only Syriac Christianity’s enduring rootedness in Hebrew scripture, but also its cultural and literary links to Jewish Aramaic culture. It is ironic that the Semitic cultural and linguistic context of early Christianity has been so thoroughly obscured. Jesus, after all, was an Aramaic-speaking Jew, and many early converts to Christianity spoke Syriac, a form of Aramaic which diverges only superficially from the Aramaic spoken by Jesus. Through the fourth century, this distinctly Semitic expression of Christianity remained largely untouched by the influence of classical philosophy that dominated Christian thought in the West. Aramaic is widely associated with the Bible and the Dead Sea Scrolls, but its role as a Christian language with a rich literary tradition of its own is rarely acknowledged. Building on the literary legacy of its origins in Judaism, native Syriac Christianity produced an enormous body of literature that articulated a distinct understanding of the faith, all in the Syriac dialect of Aramaic. By the fourth century the stage was set for an explosion of creative energy that was ignited by the Christian poet and teacher Ephrem the Syrian. Today Ephrem is not quite the obscure figure he once was, thanks to a growing number of translations of his works into modern Western languages. He was born early in the fourth century in the northern Mesopotamian city of Nisibis (modern Nusaybin), the center of a thriving Jewish community that boasted a prominent rabbinic school. He died in 373 in Edessa (modern Şanliurfa). Today both cities are in Turkey. (Edessa’s earliest Syriac speakers called it Urhai, believing it was the Ur mentioned in the Bible as the birthplace of Abraham.) Ephrem is one of the fathers of the church, scholars so named for their contributions to the articulation of Christian faith during its formative period. Though few would contest his inclusion among these luminaries, little that pertains to this mostly Greco-Roman company prepares us for him. Grounded in the classical curriculum, the fathers wrote in Greek and Latin, and used the abstract language of philosophy to shape the central beliefs of the faith. Ephrem, on the other hand, was a Semite who wrote exclusively in Syriac; and while he shares some of the theological concerns of his contemporaries who wrote in Greek and Latin, there is a crucial difference that goes well beyond language. What sets him emphatically apart from the mainstream Christian authors of his day is his utter abhorrence of rationalism—“the poison of the Greeks,” as he called it. For Ephrem, abstract philosophical language and cleverly constructed epistemologies had no place in theology. Divine truth, like life itself, required a subtler, more comprehensive language. Only poetry was sufficiently allusive to intimate the truths of God. Ephrem gave voice to ancestral memories that identified Syriac Christians with a shared history. His poetic compositions found a permanent place in the liturgy, where they sustained a common cultural memory that coheres to this day among Syriac Christians. This common identity continued to be affirmed even in the wake of theological controversies that ravaged Syriac Christianity in the century following Ephrem’s death. From their earliest encounter with their Muslim Arab conquerors in the seventh century right up to today, Syriac Christians have made essential contributions to the culture of the Middle East. Within a century after the initial Arab conquests, they had acquired a high degree of technical competence in Arabic. Syriac and Arabic are both Semitic languages, with related root and pattern systems as well as shared vocabularies. This linguistic convergence helped Syriac Christians make historic contributions to Arabic intellectual life. With the support of the Abbasid caliphate of Baghdad, Syriac Christians undertook a monumental translation project that lasted from the eighth to the tenth century. The aim was to make the wealth of the Greek intellectual tradition preserved in the Christian schools of Edessa, Nisibis, and Gundishapur available in Arabic. As a result, not only did Arabs gain access to classical learning, but the Arabic language was transformed into a medium suitable for intellectual life—and for empire. In the incisive formulation of historian Peter Brown, “Muslims talked their way into the Middle East quite as much as they fought their way across it.” It is widely known that classical texts preserved in Arabic contributed to the rediscovery of the ancient learning in Europe, paving the way for the Renaissance. Rarely acknowledged, however, is the essential role played by Syriac Christians in this process. And Christian contributions to Arabic culture and letters have continued into modern times. In the nineteenth and twentieth centuries, Maronite Christians of Lebanon and Syria were the driving force behind what is known as al-Nahdah, the modern renaissance of Arabic that brought about the intellectual modernization and reform of the language. Today, the ancient heartland of Syriac Christianity falls within the Kurdish-dominated region of Turkey, Syria, Iraq, and Iran. The religion’s future in this disputed and highly volatile region is tenuous at best. Apart from its use as a liturgical language, Syriac remains, for now, the everyday language in three villages northeast of Damascus: Ma’lula, Bax’a, and Jubb’adin. Ma’lula is, as of this writing, mainly Christian, but the inhabitants of Bax’a and Jubb’adin are Muslims. The use of Syriac as the primary language of Muslims is unique in the history of any Aramaic dialect. As the Assad regime continues its doomed efforts to hold on to power, the toll on the people of Syria mounts. It is now estimated that more than seventy thousand Syrians have escaped to refugee camps in Turkey. More and more Christians of Greek, Armenian, and Syriac traditions from Damascus and Aleppo are crossing over into Lebanon—for centuries a haven for Christian minorities. Their exodus ominously enacts the slogan of Syrian Salifis, a puritanical offshoot of Sunni Islam that condones violence against civilians in order to return Islam to its pristine origins: al-Masihiyah ‘ala Bayroot / al-Alawiyah ‘ala taboot (“Christians to Beirut, Alawites to the coffin”). From Lebanon, some will join the growing diaspora communities of Christians from Iraq and Egypt that have sprung up in Europe, the United States, Canada, and Australia. They are fortunate only in the sense that they have escaped the bloodbath to come. Dispossessed of their land and the roots of their faith, Syriac Christians have struggled valiantly to preserve their language and culture, but assimilation inevitably has taken its toll as intermarriage and social mobility draw younger generations away from their families and churches and into the broader society. Soon, the precious heritage that has defined Syriac Christianity from antiquity will survive more as an artifact of history than as a living tradition. 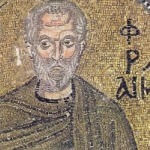 However modern scholarship chooses to remember Ephrem—as poet, theologian, or father of the church—he was first a Syrian who celebrated the bonds between the people, their faith, and their land: “This Syria,” he boasted in poems on his native Nisibis, “where Eden grew, where Abraham walked, where the Apostles taught.” The human tragedy taking place in Syria today is made only more tragic by the disappearance of Syria’s Christians from the land of their origin—and with them, the loss of a rich and irreplaceable Christian heritage. Joseph Amar is professor in the Department of Classics and director of the programs in Syriac and Middle East Studies at the University of Notre Dame.